Will an ancient fortified city-state and its main fortress count as a castle? As long as it fits into one of the categories, it is game. a temple of happiness. " 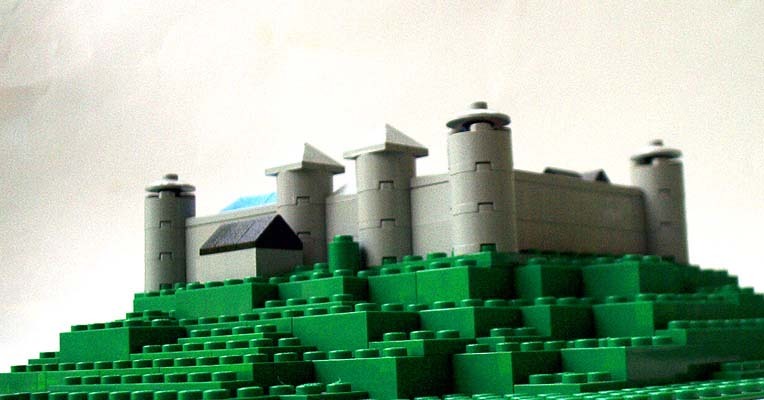 How about a seperate category for a microfig scale castle/walled town etc? You could say that it couldn't take up more than a 32 by 32 baseplate, or maybe a 48 by 48 baseplate. Just an idea. This is something I've often thought of buidling, but have never really gotten around to trying it out. It would be interesting to see what people did with that sort of a scale, and landscaping etc... think about it, you could properly sized mountains, cliffs, hills, moats, mottes etc. Great! The contest sounds awesome! I'll enter, and most likely be crushed! Hooooooooray! Cool, hey I love that castle you posted! Very nice indeed! Well that city-state is a bit incomplete due to its sheer size. So far the only complete part of it is this corner guard tower and wall section. I plan on redesigning this though, like making it bigger. Here are the other angle pics. I also have a wall section and the main gate structure, both 50% complete. The gate's entrance way is wide enough to fit a Black Falcon Fortress and another one behind it. Peoples_General, master of the vast LEGO armies! Behold! The mighty armies of my ORIGIN theme! In the rules for the contest, it states "Each submission is limited to three photographs". You should create a separate folder on brickshelf for the each contest entry and put the three pictures in there. It is fine to have all of your pictures in a different folder to show everyone. Since the admins are grading the entries, we will only look at the three pictures when making our decisions. in the -CCC - Towers, Gatehouses, or Keeps -category. Should the building have castlewalls? Does it have to be attached to the wall I mean. Or can it be a separate building? CCC - Tudor Style Shops -category, should your entry be a shop? So, I'm confused about in what category I should enter. If you're a Dutch legofan, visit Lowlug! No, it does not have to be attached to a wall. You can add walls - but we will only "grade" the tower, gatehouse, or keep. Dont forget to add technic bricks so that a CCC wall could be attached to it. It doesnt have to be a shop, although most entries probably will be shops. It should be a freestanding tudor style (Siskindian) building. Buildings like inns and town halls could work. architect wrote: No, it does not have to be attached to a wall. You can add walls - but we will only "grade" the tower, gatehouse, or keep. Dont forget to add technic bricks so that a CCC wall could be attached to it. The Keep can be separate. The towers and gatehouses should be able to connect to CCC walls. Although CCC was "invented" by North-Americans at Brickfest, fans all over the world could build in this style. Plus, CCC can connect to the old modular castle system sets. We would love to see a small CCC display at a European fest. If you would like to have a lone tower, it would be a great entry to the Miscellaneous category. In regards to a CCC gatehouse, since the CCC standard calls for the walls to be in the center of the 32x32 plate, my drawbridge hangs over the edge when lowered. since the gatehouse would be on the outside of the CCC town, can i extend my baseplate with two 16x8 baseplates to allow the drawbridge to rest? (thus making it 32x40) is this (a) allowed in the contest and (b) allowed for the CCC standard in general? thanks. CJXXX wrote: In regards to a CCC gatehouse, since the CCC standard calls for the walls to be in the center of the 32x32 plate, my drawbridge hangs over the edge when lowered. since the gatehouse would be on the outside of the CCC town, can i extend my baseplate with two 16x8 baseplates to allow the drawbridge to rest? (thus making it 32x40) is this (a) allowed in the contest and (b) allowed for the CCC standard in general? thanks. I don't see any big problem with it (in terms of both a + b). It doesn't seem like any big change of the standard, and doesn't seem to give you any sort of unfair advantage for the contest.